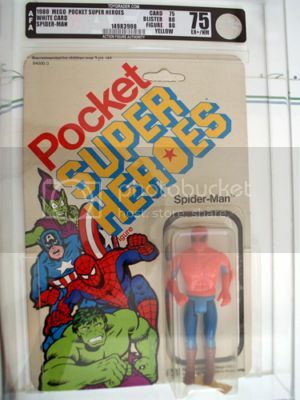 Up for sale is the very limited edition “White Card” Spider-man Pocket Super Heroes. The card has vibrant colors, the figure is fully intact, original price sticker on the bottom of the blister, the card has not been punched. 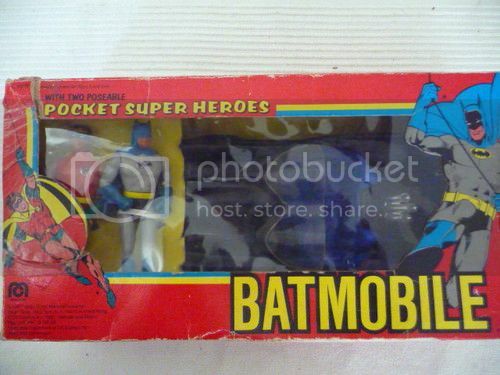 THIS IS A NICE VINTAGE MEGO 3-3/4" BATMAN POCKET SUPERHEROES FIGURE. A GREAT OLD TOY. FRESH FROM A MEGA WAREHOUSE BUYOUT. YOU GET THIS ONE OF A KIND MEGO. COMES IN NICE SHAPE ON FLAT CARD UNPUNCHED. GORGEOUS VIBRANT RED FLAT CARD WITH TIGHT BUBBLE. ONE OF THE HARDEST FIGURES TO FIND FROM THIS SERIES. UNIMPROVABLE. Last edited by vintage spideyfan; Oct 8, '12 at 7:58 PM. 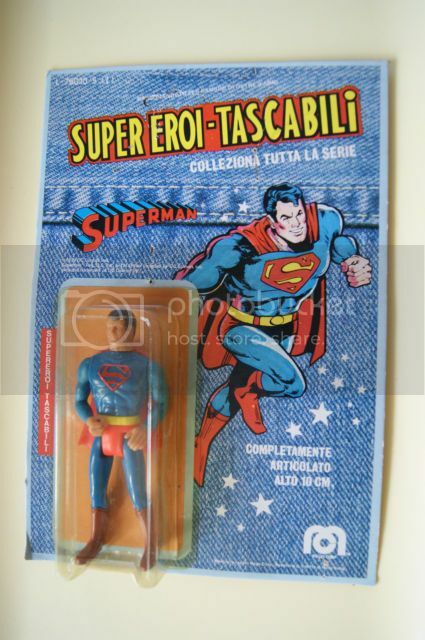 Rare SEALED, Unpunched Mego Denim Pocket Super Heroes SUPERMAN (SUPER EROI TASCABILi) from Italy. 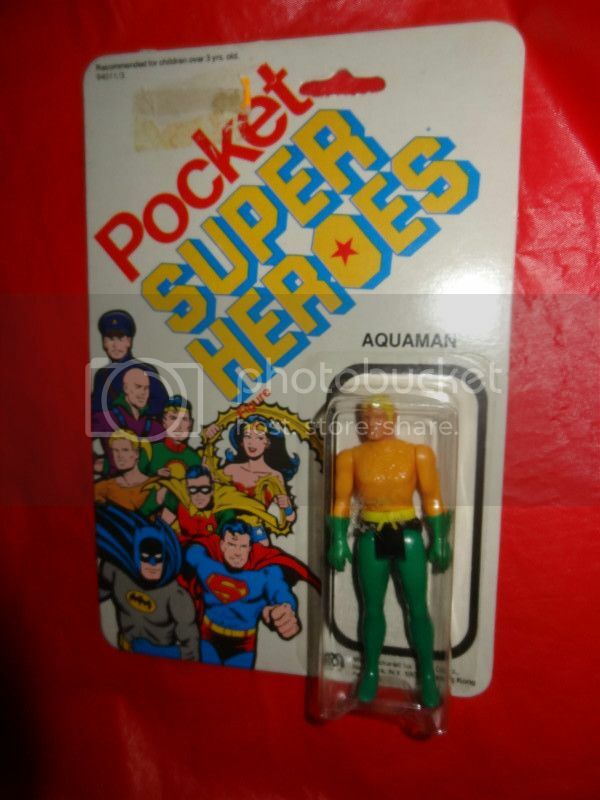 The RAREST of all Pocket Super Heroes carded figures! 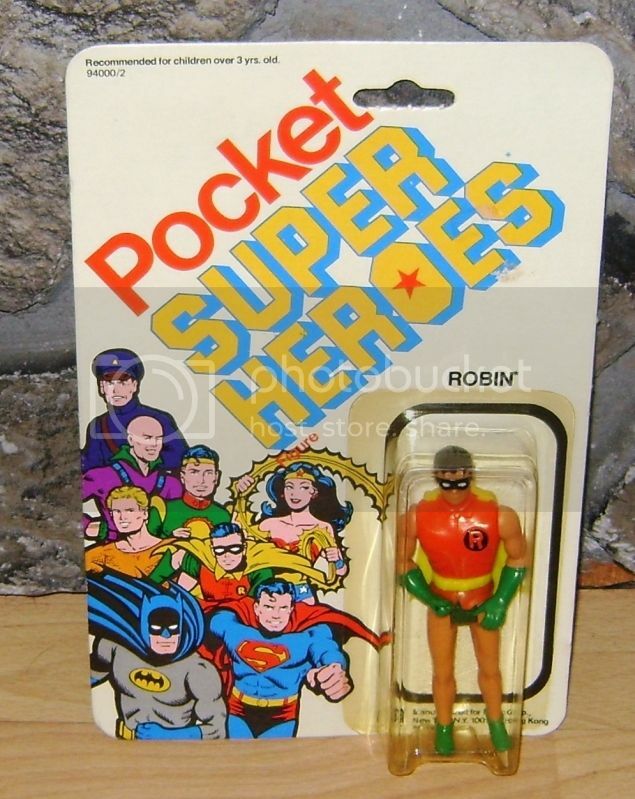 You don't have a complete Superman, pocket heroes, or MEGO collection without this UNPUNCHED beauty!! I've only seen 2 in my life! 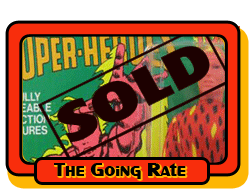 One on Megomuseum... and this one! 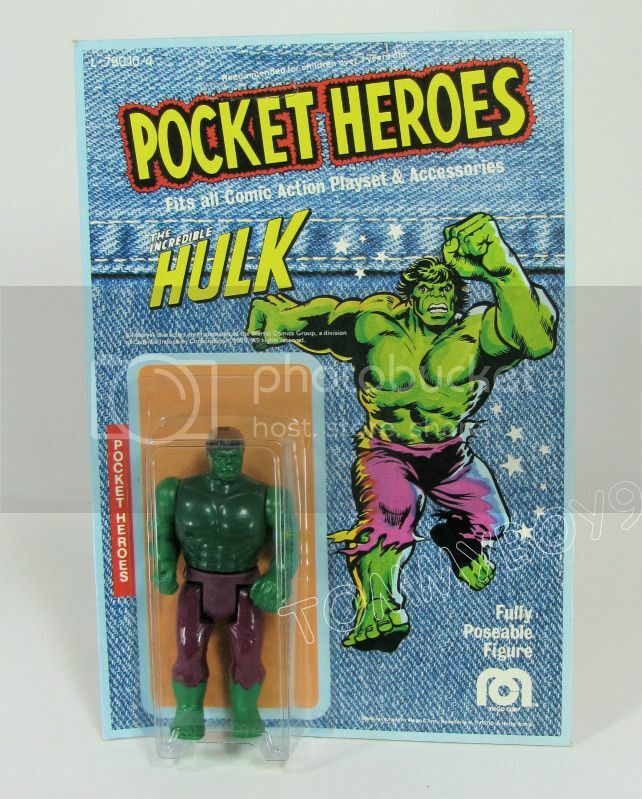 Up for auction is an 3-3/4" Hulk from the Worlds Greatest Superheroes Pocket Heroes line. Hulk comes sealed on a unpunched near mint US blue jean pocket heroes card dated 1979. The Incredible Hulk is in mint unused condition and has never been removed from the factory sealed card. The card and bubble look like it was pulled from a sealed case yesterday and as close to mint as they come and would be nearly impossible to upgrade after this. The bubble is firmly sealed on all sides, is crystal cleaer without any cracks, splits, dents or holes. The card has amazing vibrant colors without any tears or rips. The card is super flat, without any edge wear with crisp flat corners. The biggest thing worth mentioning is someone wrote "1.15" on the back in pencil. I have not tried to erase it, but will leave that to you. Not much to describe except the card is as close to mint as you will ever find and perfect for the pickiest of collectors. The numerous large pictures leave little for interpretation. Item is sold as is, so please ask questions before bidding and before the auction ends. Please e-mail me if the links do not work or if you want to see giant versions of the pictures below. Good luck! 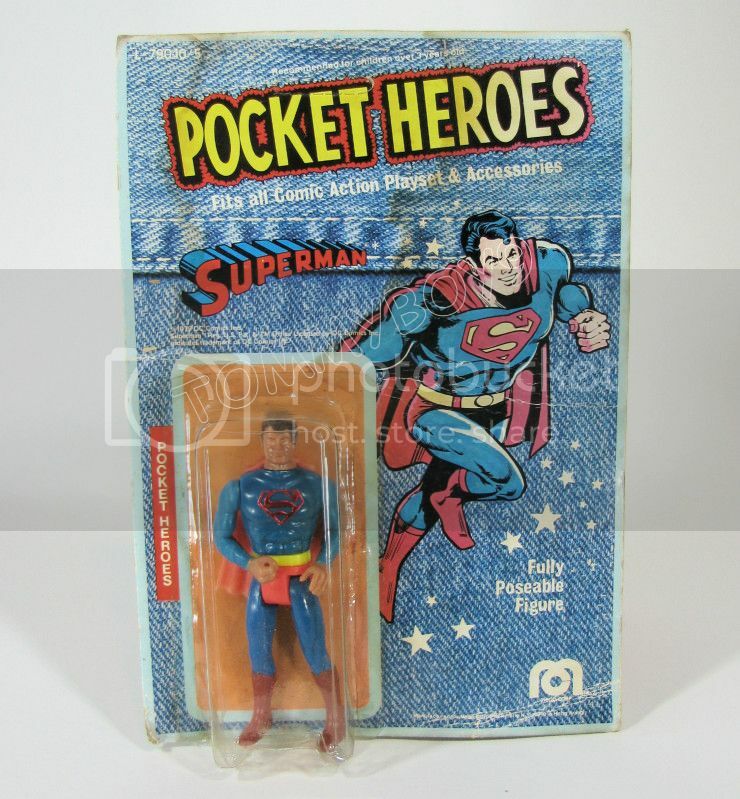 Up for auction is an 3-3/4" Mego Superman from the Pocket Heroes line. Superman comes sealed on a unpunched US blue jean pocket heroes card dated 1979. Superman is in mint unused condition and has never been removed from the factory sealed card. The bubble is firmly sealed on all sides, has nice clear color, does not have any cracks, splits, or holes. There are some dents in the bottom left corner of the bubble that can be seen in the pic, but difficult to notice when on display. The card has nice colors without any tears or rips. The card does have some edge and corner wear with some creasing in the bottom right corner of the card and back of the card. There is some water staining that can be seen on the front, but is more visible on the back. The card is not mint, but displays very nice for a late scarcer variation. 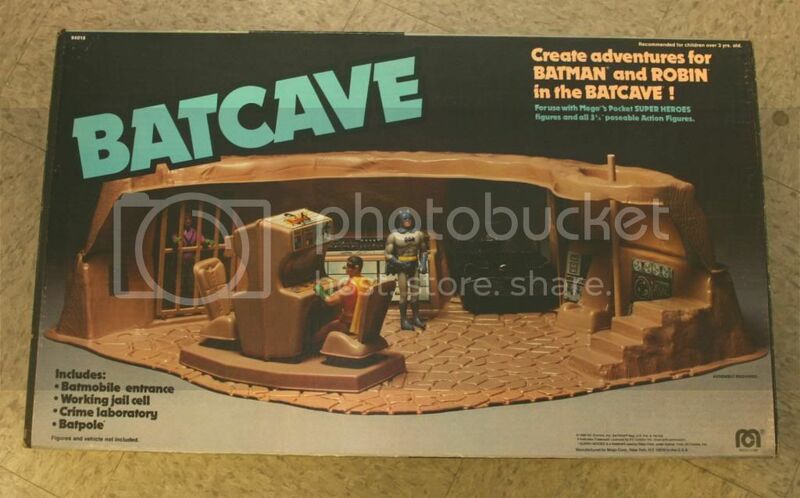 1980 Mego Batman Batcave Playset designed for the 1979-1980 Mego Pocket Heroes series. The Batpole is missing. Stickers are intact. 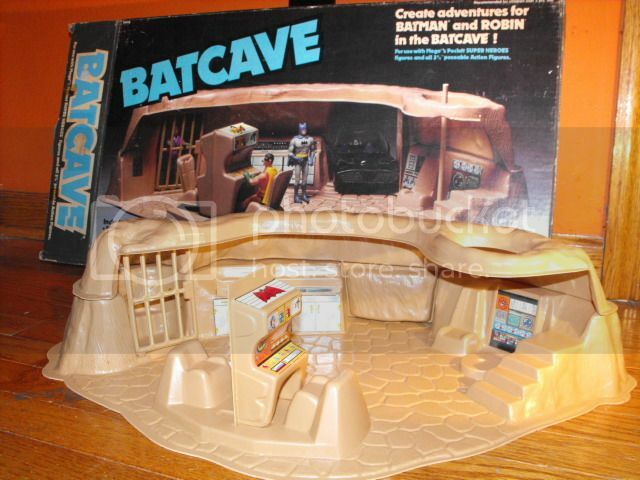 Playset does not have any cracks and is in very nice condition. The box shows age appropriate wear, some creasing -- as shown in the photos.